The Tomorrow series consists of seven books that should be read in order. The first book of the series is Tomorrow, When the War Began. Ellie Linton: Our narrator. Ellie was born and raised on a cattle and sheep farm not far from the edge of the country town of Wirrawee. Corrie Mackenzie: Ellie’s best friend. Homer Yannos: Ellie’s neighbour and close friend. Fiona Maxwell: Fi is more brains than brawn. Lee Takkam: Lee is also more brains than brawn. Robyn Mathers: The pacifist of the group. Chris Lang: An introverted, but well liked boy. All eight of them are regular teenagers getting ready to enter the world of adults. They are all filled with constructive and less constructive qualities and I can see why so many would identify with them. At the beginning of Tomorrow, When the War Began the gang feel so young to an old person like myself, but that does not last. They certainly retain their youthful optimism but gain some of our adult cynicism. I think another thing that might appeal to readers is John Marsden’s willingness to address difficult topics. One of these is death. Unfortunately death is one of the consequences of resistance in war and so it will be for this gang. And, finally, There is plenty of romance and action, both kept well within the young adult literature boundaries. The writing certainly kept me going and Marsden raised some interesting questions along the way. In Tomorrow, When the War Began a group of friends (in their last year before college) go camping together. They’re all exited and have a wonderful week together. On their way back they find their homes empty of people and their animals suffering from neglect. It turns out all of their families have been collected at the showground by a foreign power trying to take Australia over. The teens have to decide whether to fight or surrender. 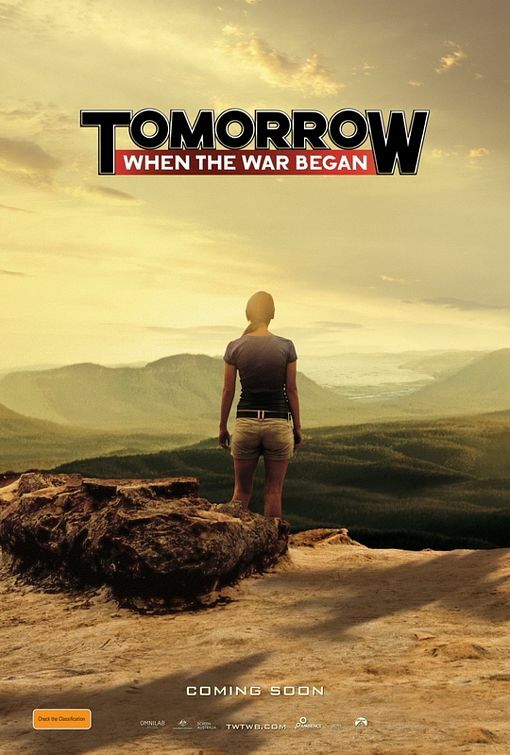 2010: Film-adaptation released based on Tomorrow, When the War Began. Australian adventure movie written and directed by Stuart Beattie. Even though the story is placed at the time of the Civil War in the US, I imagine Robin Oliveira’s own background as a nurse helped in describing some of the work and attitudes we read about in her novel My Name is Mary Sutter. At this time being a physician and a woman was practically unheard of. Physicians were trained through apprenticeships, and for a man to take in a woman as a student would mean overcoming prejudices. Professionally schooled nurses were also a thing unheard of. Apprenticeships were the way to go if a woman wanted to become a mid-wife or assistant to a physician. All of this haphazard training of either physicians and nurses left both professions with vast differences in the abilities of the people who had finished their training. Some nurses and doctors made matters worse for their patients while others were miraculous healers. Mary Sutter’s mother was a mid-wife and Mary had gone along with her on her many trips into the child-bearing population. What Mary learned about herself during those trips was that she would love to become a surgeon and thereby save people who otherwise did not get visited by a physician in time. Due to the above apprentice-shipping she was refused this opportunity and also refused admittance into medical school. Mary Sutter was nothing if not determined in eventually reaching her goal. The US Civil War presented her with one such path. Washington was desperate for help on the battlefield and many women felt called to duty. Mary Sutter happened to be one of them. Her experience seems representative of the others I have read of. As such Sutter’s experience seems to correspond with the experiences my nurse friends tell me of today. Arrogant doctors, incompetent doctors, miracle doctors and patients who span the gamut from assholes to angels. As a someone who has been a patient I have met nurses of all kinds but mainly wonderful ones. Most of my nurse friends feel a “call” to serve and this is their way of serving others. Amazing people! War is a gory and horrifyingly brutal affair. Not one gram of glory is present anywhere on the battlefield. But what a school for aspiring doctors and nurses. One doctor Mary Sutter had to work with had to care for more than 100 men. She helped with operations and learned how to treat stitch wounds. Eventually she managed to be sent to the front and learned how to amputate and live with the gore of poor medical hygiene. I liked her character. Mary was a goal-oriented woman who worked extremely hard to achieve her dreams and she was certainly a woman that I could have looked up to. Inserting extraneous yet historical characters did not work well for me. It was Mary I wanted more of. But my wishes are irrelevant to an author’s work and it isn’t even a complaint just an observation.